Once a site of heavy industrial activity, the Campbell River Estuary has undergone a dramatic transformation. These days, looking down into the shallow river water swirling lazily past the rocky shore, it is easy to spot dozens of finger-length Chinook fry milling about in the weeds and algae. At the end of the 20th century, such a sight would have been rare, despite the Campbell River's acclaimed status as one of British Columbia's most prolific salmon spawning rivers. Thanks to key partnerships and a caring community, the Nature Conservancy of Canada (NCC) has begun the revitalization of a heavily impacted shoreline into a thriving hub of nature. In 1999, NCC, the City of Campbell River and the Tula Foundation joined forces to purchase a small island in the centre of the estuary, known as Baikie Island, and a portion of the adjacent foreshore. After extensive surveying and planning, restoration crews set to work ripping up concrete. They excavated more than 38,000 cubic metres of fill and regraded the shoreline to its natural contours. In addition, they dug two new backchannels and replanted native vegetation in marsh and riverbank areas. These restoration efforts have been highly successful. Today the Baikie Island Reserve is a world-renowned example of how swiftly a landscape can be shepherded back to health. The buzz of saws has been replaced with the songs of marsh wrens. Eagles and black bears frequent the area. The marshes and streams abound with fish fry. This video was made in partnership with the Vancouver Aquarium. 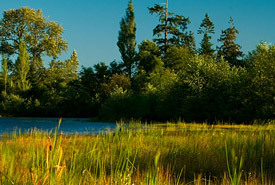 NCC's success with the Baikie Island Reserve was only the first step in the greater project of reclaiming all of the Campbell River Estuary. Seeing another opportunity to add to its conservation and ecosystem restoration efforts, NCC, the City of Campbell River and the Tula Foundation purchased another piece of the Campbell River Estuary in the fall of 2007. At the time of purchase, this two-acre (0.8-hectare) waterfront property that had been the site of a cedar shake mill bore little resemblance to the rest of the estuary that has been nurtured back to health. Still, the land was ecologically important due to its proximity to Baikie Island and its influence on the intertidal area at the head of the estuary. Working with the local community and engaged supporters, NCC restored the original marsh shoreline. This included "daylighting" (uncovering) a fish-bearing stream that lay buried under the rubble of industry. NCC undertook this restoration project in collaboration with the City of Campbell River, Fisheries and Oceans Canada, the Discovery Coast Greenways Land Trust and the local community.